My first print had turned out well, and I was busy building quite a large castle in the air, but the next couple of months would actually turn out to be quite frustrating. The main problem stemmed from the difficulty of obtaining an adequate 'hanshita', the illustration on ultra-thin paper that would be pasted on the woodblock to carve the next print. The bromide photographs had arrived from the microfilm company working with the Toyo Bunko, but had turned out to be unsuitable. The strong colours (reds, browns, etc.) had reproduced so deeply that they made the black lines of the figure indistinguishable, and in addition to this, there had been a defect of some kind in the camera, and blank spots appeared in each print, one of which covered Ono no Komachi's eye. Strike one. On a previous visit to the block maker Shimano-san, I had met Ishii-san the carver, and Michiyo and I now dropped in to see him to see if we could get some information on hanshita preparation. He recommended that I use 'strip' film, which is made of a thin photographic film mounted on a thicker carrier. After exposure under an enlarger and developing, the thin film is pasted on the woodblock. Ishii-san introduced me to a print shop familiar with the process, and they asked me to bring a colour negative of the Ono no Komachi print, which they could then use to make the strip film. A week later the negatives arrive in the mail, and again I am disappointed. They have been prepared by a different company, who have not understood my requirements, and who have shot them at 'half-frame', making good enlargement almost impossible. It seems that there are two companies working with the Toyo Bunko, accepting orders on alternate days. My order has gone to the 'wrong' company. I have an enlargement made, and the strip film maker starts his work. When I finally hear from him again (4 weeks later), the resulting film is useless. Details are blurred, and red and black have become indistinguishable. Strike two. A few years before this all took place, Michiyo and I had visited a Mr. Saeki, a woodblock print publisher in Nerima-ku, and had purchased a few of his prints. He had been quite friendly at that time, and we now thought of seeing him again, to ask for advice on the hanshita problem. We spent a very enjoyable couple of hours there, and he showed us some samples of incredibly detailed carving work from the Meiji and Taisho eras. Seeing those prints was a real eye-opener, and it certainly made me realize just how long a journey it was on which I was embarking. His advice on the hanshita was to obtain a much larger negative (4x5 inches). This would result in a very clear image being reproduced on the woodblock. The next day I checked with the microfilm company to see if they could supply this type of negative. They would be happy to - with only one small catch - negatives of this type would cost about 13,000 yen each, out of the question for us at that time. Strike three. All was not bad news however. In late February a bulky package arrived from Fukui Prefecture. 100 sheets of beautiful handmade Echizen Hosho paper from Yamaguchi-san. 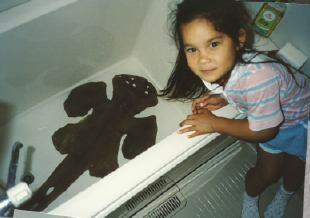 Now if only I had a design to carve, and a block to carve it on! Where to turn from here? When I lived in Canada, I read many books about Japan and got to the point where I 'knew' a lot about this country. I picked up facts and figures, a bit of this and a bit of that, and I 'learned' what Japanese people were like ... typical fathers for instance. Dedicated to their company, early morning train, home late eight nights a week, putting their family second, living for their work ... we all know the picture, right? Of course, since coming here to live, I have learned that the picture is not quite as bleak as that. One day recently I got a view of another side of the picture; I visited the Kamata family, who are collecting my prints, to get better acquainted. As I sat and talked to Naritsugu Kamata, with his daughter Akemi-chan busy interrupting to show me all her treasures, it slowly dawned on me that I was talking to a mirror. I heard him tell me about his desire to live in the country and build a home, and to create a lifestyle in which productive work blended with family life, rather than being arbitrarily separated. I had not heard such talk from a Japanese before. Of course, we all understand that behind the rhetoric we read in the newspapers, a Japanese man and a Canadian man may have pretty much the same goals in life, but I was a bit surprised to find such a close correspondence. Kamata-san and Yoshimi work together and run a small after-hours school for students. Of course, many of his students are simply preparing for their next examination, but he has a dream of building his school into a place for 'lifetime study' and personal achievement, rather than for simply working to pass next week's test. The two of them are devotees of Aikido, and although I have never been a fan of martial arts, as they explained something of the philosophy behind their study - clearing ones mind of extraneous 'noise', focussing ones attention, and bringing a reservoir of deep strength to bear on the job at hand - it seemed to me that perhaps this was just another way of describing what I see when I visit Matsuzaki-san and watch him printing. On one of my visits to Japan about ten years ago, I purchased a woodblock print made a number of years ago by Toshi Yoshida. It depicts a scene in Fukui Prefecture, a large vermillion gate to a shrine in Otaki village. Mr. Yoshida must have sketched the scene on a trip to visit one of the workshops in the town, for this is one of the famous papermaking villages of old Japan. 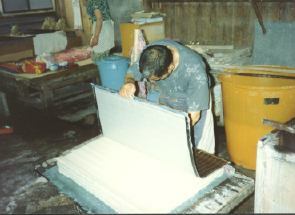 For many hundreds of years the principal occupation of the residents has been the production of traditional Japanese paper, specifically 'Echizen washi', after the Edo-era name of the district. As my family strolled up the slope through the village one morning late this past August, we found ourselves face-to-face with the scene shown in Mr. Yoshida's print. The basic view hasn't altered much; stone lanterns still guard the approach, and a thatched roof house stands near the large gate, which still straddles the road. The passage of the years is marked by a few changes; the new asphalt road surface, the convenience store visible off to one side, and the trucks roaring through the gateway loaded with bales of paper from the factories which have largely replaced the old workshops. We had left our hotel quite early, but when we arrived at the workshop the day's labour was already well under way. 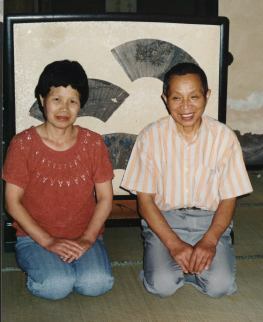 Mr. Kazuo Yamaguchi and his wife Kinuko were busy at their task of turning tree bark into works of art, glowing sheets of 'washi'. 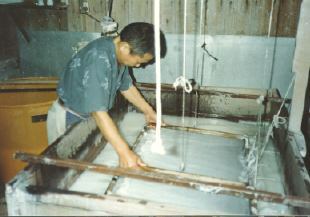 They were doing the final preparation necessary before the actual work of 'rocking' the paper could begin, Kazuo-san rinsing a pile of kozo (mulberry) fiber which has just been beaten, and Kinuko-san picking out unwanted pieces of dark coloured bark. It was a day just a few months after the end of the war when the 15-year old Kazuo first started work in this room, the seventh generation of his family to train in this craft. He has been here ever since, spending seven days a week bent over his vat of kozo fibers, holding a wide bamboo screen, and dipping and rocking, dipping and rocking, until each sheet of paper takes shape before his eyes. Now, 45 years later, as I stand by his side and watch, I am amazed at the intensity with which he works. As he rocks the screen gently forward and back his eyes are never still, scanning every square inch of the emerging paper surface for imperfections or problems. A casual toss of the wrist sends a lump of fiber flying off the screen. A slightly stronger shaking motion smooths an overly thick area. He is in complete control of the developing sheet. As the day wears on, the sunlight slants further into the room, illuminating the kozo fibers in the vat and turning the mixture into an iridescent liquid silk, swirled by his dipping motions. The pile of paper grows higher, and by the time he is finished when the sun goes down this evening there will be between 100 and 150 sheets stacked there. Over the next few days these will be drained, squeezed in an ancient press, dried on wide boards, and then finally shipped out to an impatient printmaker somewhere, perhaps in Japan, or perhaps in Canada or Europe, one who has been waiting for the shipment for a long time. A generation ago this area was crowded with workshops run by people like Yamaguchi-san, but over the years, one by one, they have either switched over to mechanized methods of production using wood pulp, or have closed their doors for lack of new workers willing to take over. These days, young people willing to step into their father's shoes are few and far between, especially when those shoes will spend so much time rooted to one spot, and when the work is so old-fashioned and repetitive. Demand for paper like Yamaguchi-san's is high, but he is forced to turn away customers. There are only so many hours in a day that one man can stand there with his hands in the vat. Material supply is a problem too. Cultivating and harvesting the mulberry trees is very labour intensive and basically unrewarding work, and it is becoming more and more difficult for Yamaguchi-san to obtain adequate supplies of raw material. Every year more and more of his suppliers close their doors, and the story is always the same - there is nobody to take over from the elderly workers who are retiring. When I get nervous and ask him about future supply, he laughs and tells me not to worry. He will certainly be able to make the paper I need to complete my print series over the next seven or eight years. As for the future ... he simply shrugs his shoulders. In future issues of this newsletter you will be reading more about the Yamaguchi family. Their washi plays a very important part in my work. It is literally impossible to use any other kind of paper for woodblock printmaking. The repeated full-strength rubbing on the back of each damp sheet during the printing process would utterly destroy any Western paper, and even most weaker Japanese papers. Kozo is the material ... and Yamaguchi-san is the man to put it together. Ever since I have been making prints on his paper, I have sent him a copy of each completed print. I want to make sure that he is fully aware of what an important part he plays. Usually, once his paper leaves his shop, he never sees it again, but I want him to see in his mind, as he stands in front of the vat, the finished product. One of the great pleasures in this project for me is to view the entire process, the bringing together of scraps of tree bark, lumps of iron, clods of coloured earth, scraps of shark skin, sheaves of bamboo leaves .... the list seems endless. When you receive your next print from me, look along the right hand vertical margin. The characters printed there tell the story: 'paper by Kazuo Yamaguchi'. 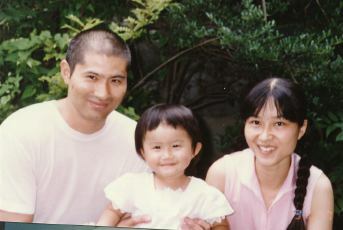 Mr. and Mrs. Yamaguchi, for your dedication to your ancient traditions, thank you very much. In the spring issue this year (#3), I discussed the procedure for preparing each woodblock for carving, with the pasting down of the 'hanshita' - the thin paper which carries the image. In this issue we will look at the carving tools themselves. Woodcarvers working in modern styles use a bewildering variety of knives and chisels, but those few of us who choose to live in the past (or at least work in the past) generally use a more restricted range of tools. The bulk of the carving is done with only three different tools, each of which is available in various sizes, selected in accordance with the delicacy of the work in progress. The most important of these, and the heart of the woodcarver's work, is the cutting knife known as the 'toh'. The history books tell me that it 'descends' from the short knife that was worn together with the sword in the old days, and indeed, some of the older carvers even today refer to it as the 'kogatana', small sword. Like practically all Japanese edged tools, it is made up of two layers of steel hammered together. The carbon content of each layer is different, one optimized for producing a sharp edge (but which makes it quite brittle), and the other designed to 'back up' the first by adding strength and springiness to the blade. Of course, Japanese metal working technology has been highly advanced for centuries, with the most famous example being sword making, but even such plebian tools as wood-carving knives are made with essentially the same process. The 'toh' is a very responsive tool, sharpened every few minutes by the carver himself, and capable of incising razor-edged lines in the sometimes rock-hard cherry wood. Although the concept is simple - "see that black line ... carve it" - there are a million tricks and techniques involved which I am picking up, mostly through self-discovery, but also with the assistance of a couple of the older carvers. I am gradually coming to think of my 'toh' not a piece of metal with which I 'scratch' at the wood, but as a brush, a calligraphy brush with which I 'stroke' the characters and lines. After all the outlines have been incised with the knife (which may take weeks), the 'marunomi', round chisels, are then used with a mallet to clear away waste wood surrounding the design area, and the floor quickly becomes covered with wood chips. I remember watching master carver Ito-san (who we will be meeting in a future issue of this newsletter) use a wide marunomi and a gigantic mallet to clear away wood, coming to within a few millimeters of delicately carved areas. He was talking to me as he worked, sometimes not even looking at where the chisel was going. When this step is done, the carver then turns to his 'aisuki' or flat chisels, to clear away waste remaining in the space between the carved lines and the area cleared by the marunomi. Mine range from 3mm wide down to about 0.5mm. 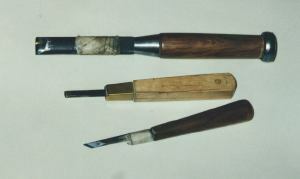 Sometimes a wide flat chisel is used to clear extra-large areas, and a simple straight chisel is used (by the printer) to cut the 'kento' guide mark for the paper, but the three types of tools outlined here suffice for the traditional carver. It is giving me great pleasure to learn how to care for and use these simple tools, and perhaps by the time I reach Ito-san's age I will feel completely comfortable with them. Until then, I will continue to watch and practice, and over the years, try to acquire all the skills of the 'hori-shi', the traditional carver. Will I live that long? We'll see!